Comfrey has been used medicinally since as early as 400 B.C. Its name literally means to grow together or to heal. It is known by other names as well including knitbone, bruisewort and boneset. This herb has been proven valuable through the ages and continues to have value to us today. Comfrey (Symphytum officinale) is a perennial herb native to Europe but also found in the U.S. It had broad, hairy leaves pretty little bell-shaped flowers that can be various colors, from purple to pink to yellow. The medicinal value of comfrey comes from allantoin, which stimulates cell growth and promotes healing. This herb makes a nice landscape specimen and it will grow in nearly any type of soil. Ideally, comfrey prefers nitrogen-rich soil, so if you plan to cultivate your own give it plenty of organic fertilizer. They are easiest to start with root cuttings. Hardy in zones 4 through 9, comfrey prefers full sun to partial shade. It bloom during the late spring through summer and gets from 36 to 60 inches high and 2 to 4 feet wide, so plant with its mature size in mind. Make sure you have it where you want it because, once established, comfrey is tough to get rid of and it lives a long time. In ancient times, comfrey was taken internally for a variety of ailments. It was thought useful for respiratory problems, healing wounds, healing broken bones and for digestive problems. Modern research, however, has found that comfrey contains pyrrolizidine alkaloids which are toxic to the liver. Because of this, taking comfrey internally is not recommended and products containing comfrey for internal consumption are illegal. The danger of comfrey when taken internally is debated by many herbalists. The controversy arises because studies showing the toxicity of comfrey were conducted using comfrey root which has the highest concentration of toxic pyrrolizidine alkaloids. When using the leaves, these alkaloids are very low. In some of the studies that showed negative results, the alkaloid was extracted and then injected into rats. Yet this is never how comfrey would be used in a real situation. 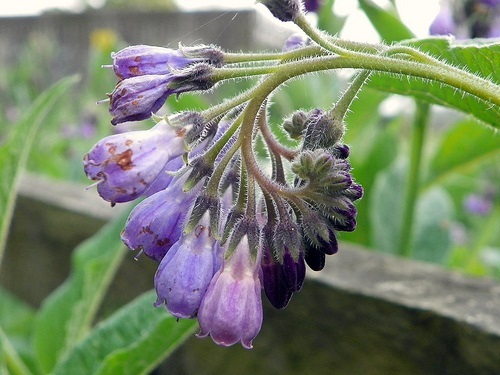 The number of deaths from comfrey is only one, and it was the result of extremely high doses. There is no record of death or injury when used in a reasonable manner, and in fact, the leaves have long been used as food for people and animals. That is something that cannot be said for pharmaceutical products. NSAIDs like ibuprofen and acetaminophen, on the other hand, increase your risk of heart attack, stroke, ulcers, ringing in the ears, liver damage and death. There are over 30,000 cases of acetaminophen overdose reported each year. With that said, the medical and scientific community says that comfrey should not be taken internally. It should not be given to children or to pregnant or breast feeding women. If you have liver damage or take medications that could affect the liver, the University of Maryland Medical Center recommends you do not use comfrey. If you suffer from muscle or joint pain, you may want to try a comfrey salve or ointment for quick relief. Take about a cup of olive oil or other high-quality vegetable oil and put it into a double boiler along with a handful of comfrey leaves. Bring to a low simmer and allow it to heat for up to an hour on low heat. The longer, the better. Strain the oil/herb mixture through a piece of cheesecloth, making sure to squeeze it out well. Add strained oil back to double boiler and add ¼ cup of beeswax. Melt it completely. Test your ointment by putting a spoonful into the freezer for a minute or two. See if it is the right consistency for your preferences. If it is too thin, melt a little more beeswax into the mixture. If it is too thick, add a bit more oil. Once you have it the way you want it, pour it into glass jars and store in a cool, dark place. You may want to try adding other soothing herbs as well, such as calendula. This ointment will keep for months and you will appreciate having some on hand for pain and inflammation.